Summer has come to a close and Jim DuFresne, the main blogger at MichiganTrailMaps.com, has some thoughts before we move into that short but sweet hiking season known as Fall in Michigan. Get out there because before you know it, winter will be here. For tips and suggestions on where to go in October check out books and commercial maps in the MichiganTrailMaps.com eshop, especially one of our bestsellers, 50 Hikes in Michigan, which actually describes 60 hikes all in the Lower Peninsula. The first time I encountered a trail runner on Isle Royale National Park was in 2009. I was on the Greenstone Ridge Trail, lugging a week’s worth of equipment and food in what I always considered to be a wilderness, when I heard something moving in the forest ahead of me. For a split second I thought it was a small moose when from around the bend popped out a lanky gentleman wearing little more than runner’s shorts, ankle socks and a polyester t-shirt. I was so stunned at the sight of him, I just stood there on the trail. When the runner reached me he was forced to stop, resulting in a snarky “exccuuse me” from him. I immediately hopped off the narrow path – at Isle Royale the slow are always expected to move out of the way for the speedy – and watched him briefly as he resumed his run to – no doubt – his lodge room at Rock Harbor with its soft bed and hot shower. I immediately resented the encounter. Here I was, shouldering almost 40 pounds, eating mac-and-cheese and Cup-a-Soup every night, sleeping in a narrow solo tent, forgoing the luxuries of life like a cold beer at happy hour, thinking these were the sacrifices you make to experience this great wilderness island. When out of nowhere comes this guy with a fanny pack that had two bottles of water on the outside and, from the looks of it after he passed me, not much more inside than a light Gore-Tex jacket and a protein bar. Backpacker headed to Feldtmann Lake on Isle Royale for the night. Since then I have learned that trail running is a relatively new activity at the park. That people utilize the same drop-off services as backpackers to run back to Rock Harbor from places like Lookout Louise, McCargoe Cove or Moskey Basin. I was told that there have been rangers and trail crew workers who celebrate the end of their summer on the island by running the 40-plus miles from Windigo to Rock Harbor. And it takes the air out of the adventure of everybody else those runners pass on the trail. I realize that people who live out west or in Alaska snicker when we call Isle Royale a wilderness. Sure there are no roads or cars on the island but it’s still hard to hang that label on a place only 210 square miles in size with lakeshore campgrounds featuring three-side shelters and large docks where power boaters anchor nightly before turning up the music or tapping a keg. This is a place anchored by a lodge and a restaurant serving freshly-caught white fish at one end, rustic accommodations and a store at the other and in between features 160 miles of trails, the vast majority well marked at every junction by sign posts with mileage. Still the park boosts one of the longest visitation averages of any national park in the country. At Yellowstone the visit average is a few hours, at Isle Royale it’s 4.5 days. We don’t go there to sightsee, but to escape into what we perceive to be a wilderness. Then that runner comes bouncing down the trail with little more than a bottle of water and a granola bar. What we have here is a trail users conflict, like cross-country skiers and snowmobilers or mountain bikers and equestrians. Don’t get me wrong. People have a right to run on trails, I run on trails. Jim DuFresne is the author of Isle Royale National Park: Foot Trails & Water Routes. But there are a few places in Michigan – not many – that have become a mecca for backcountry hikers and paddlers. Because they have the acreage, the lakes, the rugged terrain or the trail system that allows you to travel for days at a time, mountain bikes are banned, portage carts are outlawed and small outboard motors are forbidden even if you were willing to carry them across a portage. Isle Royale is obviously one of these places, maybe Porcupine Mountains Wilderness State Park and Sylvania Wilderness are others. None of them are big, still it would be nice to go there and for a few days feel like you’ve escaped to a place that’s pristine and pure and as far away from your routines at home as possible. Even if it’s just a short-lived perception. At MichiganTrailMaps.com we’re celebrating high places and great views of which both can be enjoyed from a series of ridges and treeless balds in the western Upper Peninsula. In this Trail Talk, guest blogger Eric Freedman writes about Brockway Mountain Drive and its long history as one of Michigan’s most scenic drives in an article that first appeared in Great Lakes Echo. In the latest issue of Trail Mix, our monthly e-newsletter, Jim DuFresne goes ridge walking to the peak of Mt. Baldy and one of the most impressive panoramas in Michigan. For other scenic ridges head to Isle Royale National Park (Greenstone Ridge, Minong Ridge and Feldtmann Ridge) or Porcupine Mountains Wilderness State Park (the Escarpment) for foot trails with alpine views. Need help planning a trip to these great Michigan parks? In our e-shop we have the guidebooks to help you out every step of the way no matter where your Michigan adventure takes you. One of America’s most scenic stretches of road, Brockway Mountain Drive in Michigan’s Upper Peninsula, is now on the National Register of Historic Places. The National Park Service recognized the 9-mile road built by the Keweenaw County Road Commission in 1933 for its historic importance in recreation, entertainment, transportation, social history and landscape architecture. “Brockway Mountain Drive is unique in Michigan as a scenic highway built expressly as a scenic drive through rugged country to provide access to grand scenery for the public’s enjoyment,” according to the nomination. 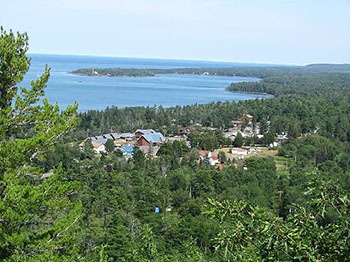 It runs between Copper Harbor and Eagle Harbor on the Keweenaw Peninsula and has nine overlooks that “provide incomparable views of Lake Superior to the north and expansive, forested valleys and hills to the south,” the nomination said. One of them, West Bluff Overlook, stands about 725 feet above the surface of Lake Superior “and offers Brockway Mountain Drive’s widest panoramic views.” It’s also the place where the Skytop Inn gift shop operated from 1935 until 2013. The building has been razed. The view of Copper Harbor from Brockway Mountain Drive. “Its construction during the Depression era represents a concerted, and successful, effort to initiate a much-needed public works project, develop the local tourism industry, and provide relief to the unemployed,” the nomination said. The Depression hit Keweenaw County hard with copper mine closings, subsistence farming and high unemployment, and unemployed miners accounted for many of the hundreds of workers on the road project. The economic hardships of the Depression sparked a push to develop opportunities for automobile tourism. And it worked. For example, between June 16 and June 30, 1939, about 9,800 cars entered the the Keweenaw Peninsula through the village of Ahmeek. The road is open only seasonally, and Gregg Patrick, the road commission’s engineer manager, said traffic is busiest in the fall. Use can spike at 1,000 vehicles a day, but at other times it’s 200 or fewer vehicles, Patrick said. Property bordering the road includes mountain biking and hiking trails, as well as nature sanctuaries. Eric Freedman is a Michigan State University professor and Director of the school’s Knight Center for Environmental Journalism. This article first appeared in Great Lakes Echo, the award-winning environmental publication produced by the Knight Center. 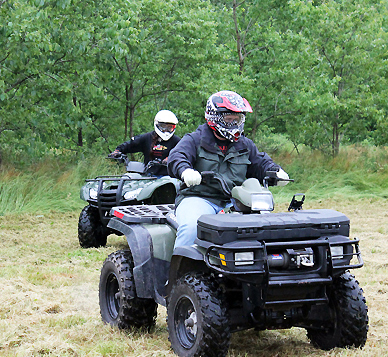 Before you head upnorth to enjoy your favorite trail, you might want to take the time to leave a comment on the pending changes that will come with ORV use in 2018 as a result of Public Act 288. In the latest MichiganTrailMaps.com Trail Talk blog, Jim DuFresne says now it the time you need to voice your opinion during the public comment period of this important bill that will open state forest roads to ORV use in the northern half of the Lower Peninsula. Heading up to our beloved Porkies this summer? 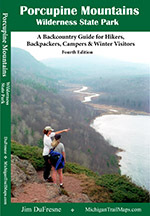 Our newest guidebook is out and now available through the MichiganTrailMaps.com eshop. 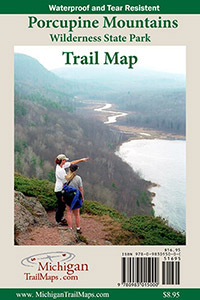 We also produced a companion trail map that is full color and printed on both sides of 24 by 18-inch waterproof paper. Like the guide book it’s available in the eshop and together the two are all you need for a great trek in the Porkies. The first time I hiked Trout Lake Pathway in Gladwin County was in the late 1980s when off-road vehicle use was exploding throughout the woods of Northern Michigan. The area looked like a war zone. There were renegade trails everywhere in the woods, entire hillsides were devoid of vegetation and turned into scramble areas. Rows of wooden posts were embedded in the ground to keep ORVers out of the day-use area and away from the swimming beach. They looked like anti-tank barriers from a World War II movie. The end result of rampant, uncontrolled ORV use was a law that said trails and forest roads were closed to such motorized activities unless posted open and the creation of a 3,600-mile off-road vehicle trail system across the state. Last fall the rules were changed when Gov. Rick Snyder signed into law Public Act 288. The act stated that state forest roads would be open to ORV use unless posted close and required the Department of Natural Resources to take an inventory of all such roads to provide a comprehensive map. The DNR is currently inventorying state forest roads throughout Michigan. But since the U.P. already allows ORV usage on state forest roads and there are far fewer of them in the southern half of the Lower Peninsula, this new act is really centered on the northern half of the Lower Peninsula. That region of the state is home to 14,000 miles of state forest roads and some of the most popular non-motorized trails in Michigan, like the Munice Lakes Pathway in the Pere Marquette State Forest, and long-distance gems like the North Country Trail and the 82-mile High Country Pathway. ORVers will not be allowed on the trails and you hope – or pray – that their sport has matured enough that those who participate in it respect the “closed” signs that every foot path will surely have posted at its trailhead. Public Act 288 would open state forest roads to ORVs unless the road is posted close to such use. The problem are the forest roads that cross pathways or when a trail briefly follows one. Or even the dirt roads that lie within sight of a trail which is the case of the Pine Valley Pathway in Lake County. On a quiet afternoon you’re enjoying a trek through the woods when suddenly a string of ORVers go ripping past you just 20 or 30 yards away. Say good bye to that forested serenity and any wildlife in the area. This bill was passed, it’s law and beginning in 2018 all state forest roads in the northern half of the Lower Peninsula will be open to ORV use unless designated closed by the DNR. And that’s going to result in an increase number of ORVers because there is a big difference – no, there’s a huge difference – between closed unless posted open and open unless posted close. But Public Act 288 did provide an opportunity for input on what roads and two-tracks should be closed to ORVs. If the hiking-backpacking-mountain biking communities ever took the time to voice their concerns and opinions at public hearings or with emails or letters, this is it. “We have to get this out there and the public has to react to it,” said Bill Sterrett, a DNR Forester. There are four ways to comment on which state forest roads should be closed to ORV traffic and why. –You can view an online map and leave comments on the website. The state forest roads in this region have been inventoried and an online map can be viewed at www.michigan.gov/forestroads. It’s easy to leave a comment and there are already impressive number that have been posted on the map. –You can send an email to DNRRoadInventoryProject@michigan.gov. –Or dash off a letter and mail it to DNR Roads Inventory Project, P.O. Box 456, Vanderbilt, MI 49795. What you can’t do while commenting is to say a state forest road should be closed because ORVs are loud, smelly and obnoxious machines. We get it, you don’t like ORVs, but it’s not a valid reason. Public Act 288 says ORVers have a right to ride on state forest roads. Better to point out where a closure would ensure safety of trail users or prevent user conflicts or protect an environmentally sensitive area. Tell them how an area of trails has been a longtime destination for “passive recreation use” and that would be destroyed with motorized vehicles. Give them details and the exact state forest roads that should closed. Sterrett says one of the most effective comments would be to show how much monetary value a nonmotorized trail is worth and how the communities would lose that if ORV use is allowed. Nothing speaks to the hearts of our Republican-control legislature like money. Whatever you do, say something, especially those trails systems you’re so familiar with because you hike or mountain bike them every summer. Say something or be content with what happens in 2018. The comment period ends July 15, 2017. We’re excited to announce that Jim DuFresne’s newest guidebook, Porcupine Mountains Wilderness State Park: A Backcountry Guide for Hikers, Backpackers, Campers and Winter Visitors, is out for anybody headed to our beloved Porkies for a little wilderness adventure this summer. The fourth edition of this classic is a 176 pages and full color, featuring great photography by Bryan Byrnes, a noted outdoor photography who practically lives on the edge of the 60,000-acre state park. More than 25 detailed maps to every trail in the park are also included along with special chapters on renting a walk-in cabin or yurt, wilderness fishing and the many waterfalls in this amazing corner of Michigan. Along with the guidebook, we’ve also produced a companion map, Porcupine Mountains Wilderness State Park Trail Map. Combining USGS elevation data with satellite imagery and good old fashion field research, the 24-inch by 18-inch, two-sided map is full color and includes all trails, cabin, yurts and backcountry campsite locations along with interesting features such as waterfalls and historic mines. The map also features exact mileage for all the trails within the park and mileage flags for segments of the longest ones; Lake Superior Trail, Big Carp River Trail, Little Carp River Trail and Government Peak Trail. Data for contour lines is provided in both meters and feet and short descriptions are provided for each path. Best of all it’s printed on waterproof and tear-resistant paper just in case you drop it while fording the Big Carp River. Porcupine Mountains Wilderness State Park: A Backcountry Guide for Hikers, Backpackers, Campers and Winter Visitors is only $15.95, the companion map $8.95. Both are available in the MichiganTrailMaps.com eshop for quick delivery. In honor of the release, we decided to reprint Jim’s introduction to the Porcupine Mountains in this Trail Talk blog. Something moved. In the shadowy light of a full moon, my task of filling the water bottles was interrupted when in the corner of my eye I saw movement on the other side of Little Carp River. I studied the black trunks of the hardwoods and pines, the silhouettes of bushes and stumps, but on this October evening all was quiet and still in the heart of the Porcupine Mountains. I was on the verge of returning to my chore when a shadow moved again; three steps this way, one step that way. It stopped; I stood up. It turned towards me; I peered into the darkness at it. And suddenly we were both conscious of each other. Man meets bear in a place called the Porkies. We both might have bolted into the woods, but 20 yards of rushing water gave us a sense of security so we took the opportunity to study each other a little bit longer. The few black bears I had encountered in Michigan looked little more than a large dog. This one had some bulk to it…a 250-pound bear? Maybe a 300-pounder? And when it turned sideways the shadow the moonlight cast of my backwoods companion was even more impressive. “Whoa!” I said softly under my breath. 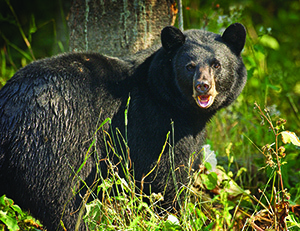 Porcupine Mountains Wilderness State Park is home to an estimated 20 to 30 black bears. It inched closer to the riverbank, nuzzled this with its nose, pawed that with its claws, and then stopped again to look at me. Only 30 yards separated us and now the bear appeared to be squinting at me. “Gotta go,” I said in a booming voice so there was no question in its mind as to what I was. I retreated up the bank in three steps or less, and after reaching the top I turned to the river again. The bear was gone. It vanished into the shadows from which it emerged without leaving a trace of its movement. I sat down on a stump and wondered what else was out there when the spirit of this wilderness descended upon me, like it always does at such moments. It’s not picturesque Lake of the Clouds or the views from Summit Peak, as dramatic as they are, that make some of us return year after year to Porcupine Mountains Wilderness State Park. It’s the feeling of being out there in a land where man is at best a visitor passing through. It’s the idea that this rugged corner of the Upper Peninsula has been explored and mapped and even laced with foot trails and backcountry cabins, but never tamed. Like a fortress against development and that oxymoron we call “progress,” the Porkies have always been this place where you retreated to rediscover yourself and the natural world around you. It’s a timeless quality first experienced by the Indians and then acknowledged by those early miners. Today it’s a priceless quality that attracts thousands of visitors who merely want to wander down a path or pause in wonder along the rocky shoreline of Lake Superior. The billboards, the golden arches, the motorized pace of our society is somewhere else. Out here it’s towering pines 300 years old and spectacular waterfalls. It’s sweeping views from rocky knobs reached by the slow and thoughtful pace of foot travel that keeps everything in proper perspective. If only for a few days, leave your vehicle, slow down and look around. There’s a bear on the other side of the river. 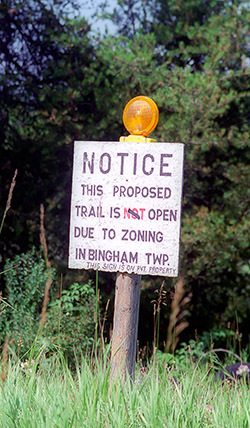 In the latest MichiganTrailMaps.com Trail Talk blog, we are again wondering why anybody would oppose a non-motorized trail that would link two of the most popular trails in Michigan; TART and the Little Traverse Wheelway. We suspect we’ll never understand. 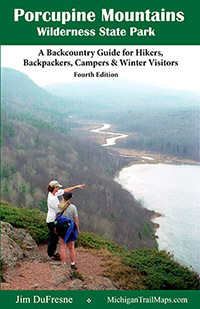 Our latest guidebook, Porcupine Mountains Wilderness State Park: A Backcountry Guide for Hikers, Backpackers, Campers and Winter Visitors, is at the printers and is full color, with great maps and looks great. Keep an eye on our eshop for when it will be available to order in late May. In the more than 30 years of covering trails in Michigan – and thus trail controversies – I’ve witness opposition to paths from home owners and shoreline cottage owners and equestrians and community leaders who were worried that the proposed Bay-to-Bay Trail in Sleeping Bear Dunes National Lakeshore would bring too much foot traffic into Glen Arbor. But the group that always amazed me the most was farmers. The salt of the earth. I covered the early years of Michigan’s rail-trail movement when farmers were often the most vocal opposition to long-distant trails, especially when the Leelanau Trail was proposed. That one got ugly fast. After the rail service ceased operations in the early 1990s, the Leelanau Trail Association (LTA) was formed in 1994 to turn the abandoned railroad bed into a multi-purpose trail. The following year LTA signed a $475,000 land contract to purchase 15 miles of the corridor that extended from Traverse City to Suttons Bay, much of it past the fruit farms and apple orchards of the Leelanau Peninsula. Almost immediately there was heated opposition leading to numerous court cases over the proposed trail. The association’s ownership of the rail bed was challenged in court by adjacent property owners claiming reversionary clauses deeded the land back to them. When that failed, opponents tried to use local zoning laws to prevent the trail from being built or people from using it. A early trail sign reflecting the opposition to the Leelanau Trail by adjacent land owners. Welcome to the Leelanau Trail. Enjoy your ride. Today none of that controversial past is evident. The Leelanau Trail is now a fully paved, off-road connection between Traverse City’s TART Trail and Suttons Bay, winding past picturesque farms and vineyards, forests, lakes and ponds. And there’s no denying its overwhelming popularity. Local bike shops rent bicycles to out-of-town visitors to pedal it. 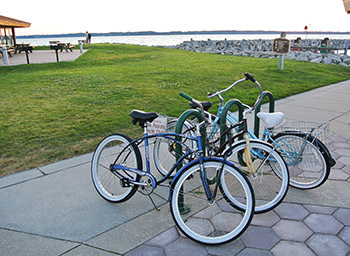 The Bay Area Transportation Authority (BATA) offers a Bike-N-Ride program with special buses that take weary cyclists and their bikes back to Traverse City from Suttons Bay. Vineyards along the way, and there is a half dozen of them less than a mile from the trail, welcome two-wheelers with open arms and bike racks. Grand Traverse Bike Tours (www.grandtraversebiketours.com) incorporates the trail in a self-guided tour of the Leelanau wine country and in the winter TART volunteers groom sections of it for both classic and skate skiing. And in all these years not once have I read about renegade cyclists freewheeling it through orchards and stealing apples. You’d think everybody; government officials, locals and especially farmers, would have learned something from this experience. But then I look at Elk Rapids just north of Traverse City and realize every new trail is going to be a struggle. Two of the most scenic and popular trail systems in Michigan is TART (traversetrails.org) that includes the Leelanau Trail and wraps around Grand Traverse Bay from Acme to Suttons Bay and Little Traverse Wheelway (www.trailscouncil.org) that hugs the shoreline from Charlevoix to Harbor Springs. It’s always been the goal of both organizations to link them and create a 325-mile regional trail system that would span across the northwest corner of the Lower Peninsula. The proposed Traverse City-to-Charlevoix Trail would be a 45.8-mile non-motorized route through the communities of Traverse City, Acme, Elk Rapids, Eastport, Norwood and Charlevoix with most of it a “shared-use path” along US-31 corridor. In other words, a trail that is physically separated from the road (and thus motorized traffic) by an open space or barrier. Like the Leelanau Trail, the proposed Traverse City-to-Charlevoix Trail would wind past cherry and apple orchards, prompting some farmers to oppose it. The scenery would be outstanding, the places to stop numerous. 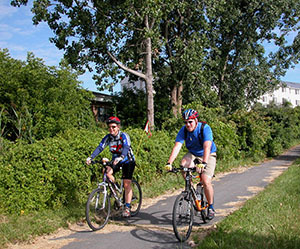 The trail would connect more than 20 beaches, natural preserves, county and township parks and Fisherman’s Island State Park. Throw a swim suit in the saddle bag. Along the way cyclists could stop at a dozen farm markets and roadside stands, fill their panniers at a U-pick cherry farm or refuel at a small café. Even vineyards with tasting rooms, like Chantal Lefebvre, are beginning to appear along this stretch of Lake Michigan. And the town that would benefit the most from such a trail is Elk Rapids, a shoreline community that seems to like its share of tourism and traffic. That’s why area government bodies, including the Township of Elk Rapids and the Village of Elk Rapids, went on record supporting the project. Now they have rescinded it. At public meetings last month farmers complained about how “increased foot traffic near their farms could impact crops” according to the Elk Rapids News. Others were worried about the liability of the chemicals they spray on their trees drifting across the trail. Then there was concern over the FDA Food Safety Modernization Act that was signed into law in 2011 with the intention of shifting the focus of federal regulators from responding to food supply contamination to preventing it. Farmers said that trail users could be in violation of the new federal law. 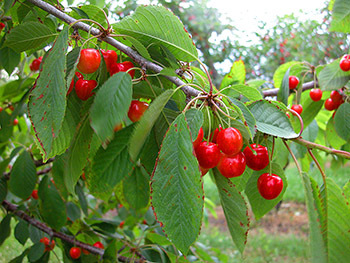 As if walking or cycling along a trail is enough to contaminate the cherries in an adjacent orchard. That’s all it took. Local government officials back pedaled faster than a clown on a unicycle and said that while they like the concept of the trail they could no longer support the project until property owner’s concerns were addressed. Bicycles at the Elk Rapids Marina in a lakeshore village that sees more than its share of cyclists during the summer. That shocked me because this village of 1,600 is more than accustomed to cyclists. The popular Ride Around Torch begins and ends in Elk Rapids and is basically a one-day celebration of cycling that fills the town with two-wheelers. Large organized rides use Elk Rapids High School to overnight and during the summer there always seems to be groups of spandex-cladded riders indulging at the Harbor Café or getting a caffeine fix at Java Jones. But somehow a farmer’s concerns over the effect of trail users on his harvest, however misplaced it might be, takes precedent over the growing economic impact of non-motorized trail users like cyclists. Like the Leelanau Trail, this link to Charlevoix will be built. Make no mistake about it. TART and the Top of Michigan Trail Council are experienced organizations with a proven track record of trail development especially in terms of fund raising and generating support. They will get it done. It just seems like every trail that is proposed these days runs into opposition that in the end requires more time, more money and, as in the case of the Leelanau Trail, lawyers to build it. It delays everything but usually changes nothing. I just hope when they finally cut the ribbon for Traverse City-to-Charlevoix Trail I haven’t retired my biking shorts yet. But who knows? Spring is here and we’ll all be heading outdoors for the first long walks and bicycle rides of the year. In this piece MichiganTrailMaps.com blogger Jim DuFresne says it long overdue that motorized and non-motorized travelers acknowledge each other and accommodate each other on roads, crosswalks and whenever else they meet. National statistics say he’s right. Don’t forget our e-shop is open 24/7 and includes last year bestseller, The Trails of M-22. You can order the full-color guidebook to 40 trails along Michigan’s most beautiful highway and then begin planning your spring get-away to that incredible corner of the Lower Peninsula. I was once riding my bicycle through downtown Clarkston, the small, historical town where I live near, and was as close to the curb of main street as possible. I wanted to give passing vehicles every inch I could because it was afternoon rush hour. I never had time to tell her that it was illegal for cyclists, or skateboarders or inline skaters or any two-wheeler for that matter, to use the narrow sidewalks in this part of town. The local law is spray painted on every intersection corner to remind us of that … but obviously not motorists. I thought about that incident when I recently read annual reports from ranging from Smart Growth America to The Governors Highway Safety Association. The stats in them made it seem like it’s us — the non-motorized travelers — against them — those in cars and trucks — and we’re not winning. Nobody in Michigan has to be reminded of the horrific bicycle deaths we’ve experienced in the past year or so; the Kalamazoo incident when five cyclists died last June being merely the worse but hardily the only one. It used to be when you walked away from motorized transportation, you felt a lot safer. But the National Highway Traffic Safety Administration (NHTSA) reported that in 2015 (latest figures available) traffic deaths increased 7.7 percent over 2014 and pedestrians and cyclists saw the biggest increase. Pedestrian deaths shot up 10 percent that year and bicyclist deaths 13 percent — more than any other type of victims, including those driving the cars. The Governors Highway Safety Association (GHSA) said in 2016 pedestrian deaths increased more than 20 percent to almost 6,000 nationally in just two years. This is the steepest year-to-year increase since GHSA began keeping records. Every day two people get hit by a vehicle in the crosswalk of an intersection. 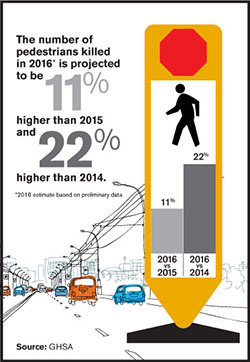 In its annual Dangerous by Design report, Smart Growth America ranks the worse and best cities for walkers by assigning them a “Pedestrian Danger Index.” PDI is a calculation of the share of local commuters who walk to work and the most recent data on pedestrian deaths. The worse city with a PDI of 283.1 is Cape Coral-Fort Myers. In fact, the top seven cities on the list are all in Florida with the streak not broken until Jackson, Miss. comes in at No. 8 with a PDI of 189.6. The worse Michigan city is labeled as Detroit-Warren-Dearborn at No. 17 with a PDI of 124.2. Overall, the most dangerous state for pedestrian deaths in 2016, according to the NHTSA, was Delaware at 3.38 deaths per 100,000 of population, closely followed by Florida. We shouldn’t cheer too much as Michigan is in the top third at 19th place with 1.71 deaths. Some reasons for the increases are obvious say these organizations. There are more cars on the road thanks to cheaper gas and a better economy. But there are also more people walking and cycling due to concerns about better health or just to save a buck or two. Cyclists follow a portion of the I-275 Pathway to escape heavy traffic on nearby roads in Wayne County. Drivers will always tell you that pedestrians and cyclists are too blame because they don’t obey traffic laws, zipping through stop signs at intersections as if they don’t apply to them. There is definitely some truth to that. On the other hand, two-wheelers will reply that the biggest problem is “distracted drivers” with far too many of them on their smart phones talking, or god forbid, texting rather than looking at the road. No argument here but you better add pedestrians at crosswalks who also have phones glues to the side of their head. In Florida, I suspect it’s a case of poor infrastructure design, streets without sidewalks or even wide paved shoulders, and an abundance of snowbirds and retirees, a large number of them who probably should have had their license withdrawn years ago. At the other end of the age spectrum, says NHTSA, are teenagers; new and inexperienced drivers who are more crash prone. In 2015, crashes involving young drivers — ages 15 to 20 — increased 10 percent from the previous year. All this would normally make me swear off roads forever and just stick to wooded paths when I need to escape outdoors and exercise. That was until last October when TART reported that an attempted assault occurred on their Boardman Lake Trail south of Traverse City. TART has ambassadors on some of its most popular trails to encourage safe usage and maintains an Incident Report Form on its web site where you can share what you’re experiencing in terms of safety and maintenance issues. Still the best advice they passed along was this: Be aware of your surroundings and keep using the trails. Good advice for all of us this spring whether we’re heading out on dirt trails, paved paths or an extension of a road. Look both ways, be alert but keeping walking, riding and hiking. Because what are the alternatives? Love that trail you’re skiing? There’s a very good chance volunteers made it possible. At Loud Creek Ski Trail in the Huron National Forest it was one man who for almost 30 years was responsible for the excellent trail system near Mio. In this MichiganTrailMaps.com Trail Talk blog, Jim DuFresne writes about Lyle Kline and why we need more volunteers like him. Need a stocking stuffer? Don’t forget the MichiganTrailMaps.com eshop is open 24/7 and includes personally autographed books by Jim DuFresne and our award-winning trail maps. Sometimes timing is everything in cross-country skiing. The night before my first visit to Loud Creek Ski Trail a snowstorm swept across northern Michigan leaving behind a half foot of fresh powder. When I was less than 15 minutes from the trailhead, the sun broke out, making the snow appear as if it was sprinkled with diamonds. And when I arrived at the trailhead, Lyle Kline, president of the Loud Creek Nordic Ski Club, had just finished grooming the trails. As the first skier on just-groomed tracks, I flew through the woods with ease. But the best part of the afternoon was the fact that the 7.5 miles of trails were practically all mine. I encounter only two other skiers and Lyle. Not a bad day of skiing. For many of us it’s the perfect Nordic experience; well groomed trails in a scenic wooded area where you’ll often see more whitetails than skiers. The key to enjoying such a day is knowing Loud Creek is there, half-hidden in the Huron National Forest, 2 miles southeast of Mio. Lyle Kline of the Loud Creek Nordic Ski Club and the club’s 25-year-old groomer. Loud Creek dates back to 1984 when Kline first scouted the area and knew immediately that the wooded hills, creeks and beaver ponds was an ideal setting for ski trails. He began lobbying folks at the Mio Ranger District office, trying to get them to do more in the winter than just carter to the snowmobilers. 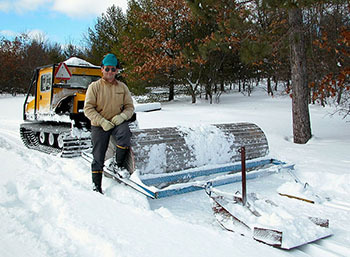 Four years later the U.S. Forest Service agreed to help develop the area if locals formed a club to purchase a groomer and maintain the trails. Lyle recruited his fellow skiers and the Loud Creek Nordic Ski Club was born. The club arranged a loan for $7,500, purchased a used Bombardier groomer and then staged bake sales, ski races and other fund raising events until it was paid off. This type of community support for a trail is nothing new. What was unique about the Loud Creek Nordic Ski Club was its size. It was tiny. Early on the club might have had 30 to 40 members but by the time I met Lyle in 2004 club membership was down to the single digits. In subsequent articles I wrote Loud Creek was Michigan’s best Nordic area managed by so few. Eventually the club went full circle. The man who started it became the sole member at the end. The old donation pipe at the Loud Creek Ski Trail in the Huron National Forest. In 2014, after devoting 30 years and countless hours – all of them as an unpaid volunteer – to maintaining this ski trail for the rest of us to enjoy, Lyle stepped away. The Mio Ranger District has since taken over maintenance and in the winter tries to groom it as often as there is staff available. But grooming ski trails is not a high priority and the U.S. Forest Service will never be able to match the frequency and meticulous care that was the trademark of Lyle and Loud Creek Ski Trail. The lesson here isn’t that Michigan is blessed with numerous opportunities for cross-country skiing, many you might not even know about. The lesson here, I suspect, is most people don’t realize how dependent our trail systems are on volunteers. The North Country Trail Association reported that this year 1,343 volunteers donated 69,708 hours in maintaining or building the country’s longest trail. The value of those hours in the private sector would have topped $1.6 million. But of course none of them were paid. Lyle thinks one winter they might have collected $1,200 but most years it was $800 or even less. 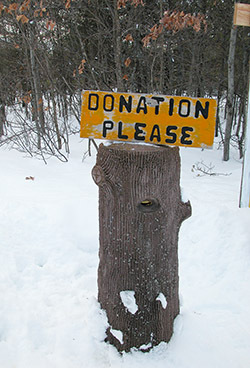 Tough to repair that 30-year-groomer or purchase a new roller when so many skiers never pause at the donation tree. This is the giving season, a time when many of us donate to our favorite causes if for no other reason than to get another tax deduction. In the next month, seriously consider the trails you love and give to the organizations who work so tirelessly to ensure they are there and open when you show up with your hiking boots, skis, baby stroller or mountain bike. The list is almost endless so the need is great. Please give. If we don’t all pitch in then it’s possible we’ll lose our trails because there are only so many Lyles in this world.